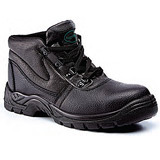 Ladies safety shoes don’t come much smarter than these black leather beauties, which are the ideal choice for office staff required to make an occasional foray onto the factory floor. And you don’t have to change into them specially, because they’re more than comfortable enough for everyday use! With a slip resistance rating of SRC, they are suitable on all kinds of slippery surfaces, while the EN ISO 20345:2011 classification of S1P means they offer more protection than many bigger and more expensive safety shoes. For more information on EN ISO 20345:2011 ratings, please click here.